Description of decorations: Red volcanic rock collected from the same site where it was extracted in the past for the construction of the perimeter edge to dry a large part of the lake and clay extracted from the shore of the lake, is the representation of the aquatic bed. Description of equipment: Basket filter BOYU EF45, with flow capacity of 1100 liters / hour although it is regulated to 350 liters / hour approximately, it uses 3 different thicknesses of sponge as Azoo mechanical filter and 2 liters of Matrix Seachem brand for the filter biological. The lighting consists of 3 IUSA brand reflectors of 4500 lumens each at a temperature of 6500 ° K. No equipment is used to regulate the temperature. Water parameters: The parameters were measured by PRO JBL Scan, Nitrate (NO3): 10 mg/l, Nitrite (N02): 0.25 mg/l, Total hardness (GH): >4 d°, Carbonate hardness (KH): 5 d°, PH: 7.6 and Temperature: 20°C. streams, there are theories that indicate in this place about 12900 years ago an extraterrestrial impact was given due to the identification of materials in a sediment. In the geographic coordinates 19 ° 56’27.2 “N 101 ° 03’19.8” W where it locates the biotope that is being represented is surrounded mainly by plains, which in the past were part of it since they were dried for agricultural use, Nowadays, the adjacent lands are used to raise livestock freely, feeding them on the fauna that grows on the riverbank and the surrounding area. There are also reliefs of clay and volcanic rock, covered by flora such as Prosopis glandulosa, Eysenhardtia polystachya and Acacia pennatula in its mostly. 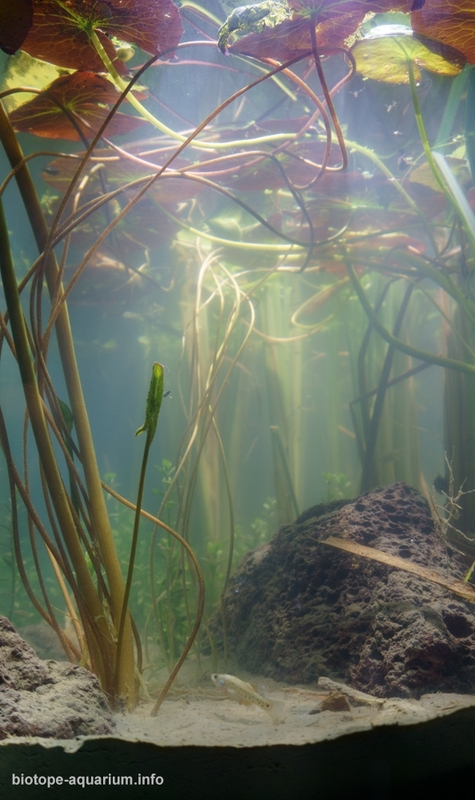 Description of the underwater landscape of the biotope: To the naked eye it is a lake of turbid waters where only patches of Typha domingensis can be seen in different places, however, it keeps in its margins very calm waters of little turbidity, where one can see another very different landscape, among the Typha domingensis grow diverse aquatic plants that are born from the shore, that is composed of a mixture of reddish volcanic rock and grayish brown clay, some plants float calmly while others emerge from the shallow bed that does not exceed 45 cm at 100 meters to the Round. Description of the parameters of the habitat: The parameters were measured by PRO JBL Scan, Nitrate (NO3): 18 mg/l, Nitrite (N02): 0.25 mg/l, Total hardness (GH): <3 d°, Carbonate hardness (KH): 4 d° , PH: 7.4 to 8.8 and the temperature varies according to the season of the year from 14°C to 24°C but maintains an average temperature of 20°C. 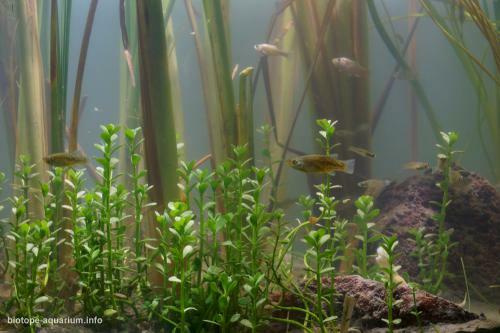 List of fishes and invertebrates occurring in the nature biotope: Xenotoca variata, Cyprinus carpio, Moxostom austrinum, Oreochromis niloticus, Micropterus salmoides, Alloophorus robustus, Poeciliopsis infans, Buenoa sp., Noctonecta sp. and Physa acuta. 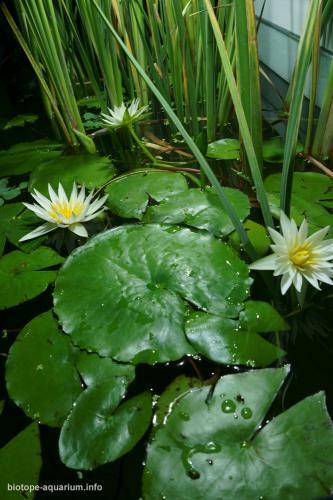 List of plants found in the nature biotope: Bacopa monnieri, Typha domingensis, Nymphaea gracilis, Lemna aequinoctiali and Pistia stratiotes. Threats to the ecology: “The waters Domestic, industrial, agricultural and livestock wastewater is discharged without any treatment, which leads to a slow but safe loss of aquatic systems and therefore of their fauna. Everything that is received arrives at Lake Cuitzeo, waste that has accelerated the aging process and as a consequence, there has been a great mortality of fish. To this the hydrological imbalance due to the low precipitations adds, in addition that its main affluents are receivers of the discharges of all type of residual waters. The objective of the management of aquatic systems until now has been its use in activities such as supply for the population, agriculture, industry and livestock, forgetting environmental services and the sustainability of aquatic biodiversity. Therefore, in order to ensure these benefits, the fishing regulations and management plans must be prioritized, in which the users of the resource must be included.” 1GALICIA, L. Y ISRADE, I. In Text: (Galicia and Israde, 2018)Bibliografía: Galicia, L. and Israde, I. (2018). Atlas de la Cuenca del lago Cuitzeo: análisis de su geografía y entorno socioambiental. 1st ed. 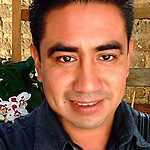 PDF Morela: Brenda Ávila Flores, pp.92-93. Photos of the natural biotope. web: https://drive.google.com/drive/folders/1H9ZDYRV-s2fLEpLLe7qlYPfpaF4uJhg7?usp=sharing Rojas Moreno, José; Novelo Retana, Alejandro. (1995). Flora y vegetación acuáticas del Lago de Cuitzeo, Michoacán, México. 31/07/2018, de Instituto de Ecología, A.C.
Silke Cram, Leopoldo Galicia e Isabel Israde. (2010). Atlas de la Cuenca del Lago Cuitzeo: análisis de su geografía y entorno socioambiental. 31/07/2018, de Universidad Nacional Autónoma de México. It is an incredible entry. The arrangement of the Typha just gives the most natural aspect, as I observed in nature, as well as the degree of turbidity in the water in a lake system, besides the importance of showing species that require our attention. This entry is undoubtedly the evolution of another that was presented in Mexico, and an evolution for good. Good job!